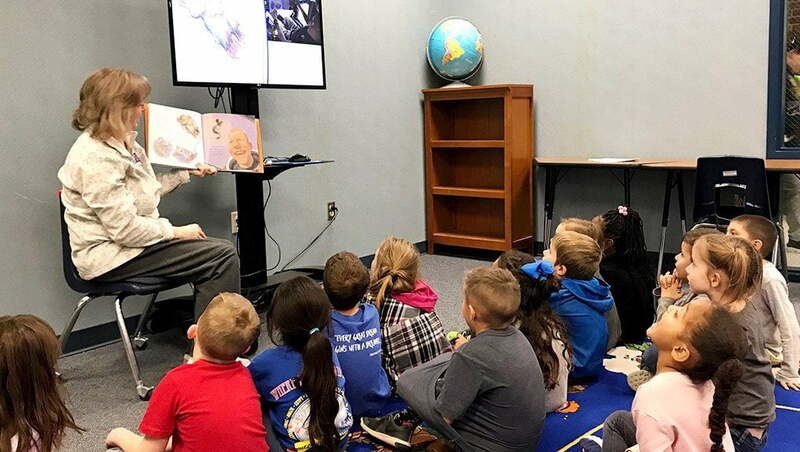 Westwind Elementary kindergarten students recently got to listen to an astronaut read a book to them from space. Twin brothers who are astronauts, Scott and Mark Kelly, were part of an experiment with NASA about the effects of aging in space. Mark went to space on the space shuttle, Endeavor, while Scott stayed home. Mark took mice on the space flight with him and one mouse, in particular, seemed to enjoy the mission and did not appear stressed at all. The well-traveled mouse inspired Mark to write the book Mousetronaut about a mouse on a space mission. Later, when Scott went on a different space mission, he took his brother’s book, Mousetronaut, with him. While in space, a video was recorded of him reading the book to children who are back on earth. Westwind students got to watch the video and read the book. Students were enthralled with the astronauts’ ability to float in space as they discovered gravity for the first time. They were also excited to see the earth through the window of the space shuttle. This was a unique introduction to a space unit for the kindergarten students and a great example of the “engage” step of the TIGERS Learning Framework.